Sports photos taken for the Oneida Daily Dispatch and http://www.oneidadispatch.com/ for the month of July 2016. 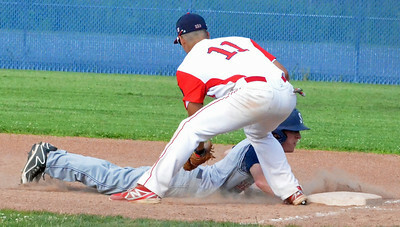 KYLE MENNIG - ONEIDA DAILY DISPATCH Sherrill Post's Ryan Palmer (9) dives into second under the tag of Smith Post's Zachary Cortese (18) for a double during the fifth inning of their American Legion Baseball game in Sherrill on Friday, July 15, 2016. 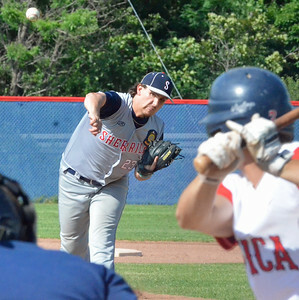 KYLE MENNIG - ONEIDA DAILY DISPATCH Smith Post pitcher Colin Shunk delivers a pitch to a Sherrill Post batter during their American Legion Baseball game in Sherrill on Friday, July 15, 2016. 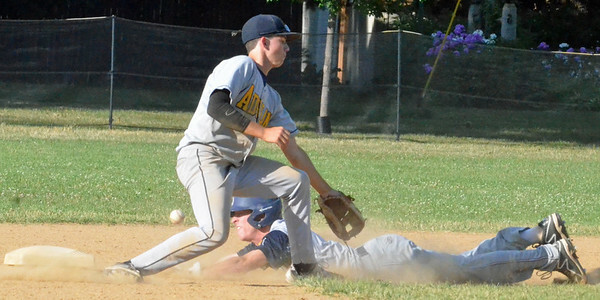 KYLE MENNIG - ONEIDA DAILY DISPATCH Smith Post's Ryan Samuels (15) dives back into second as Sherrill Post's Tyler Rotach (24) jumps to field a throw during their American Legion Baseball game in Sherrill on Friday, July 15, 2016. 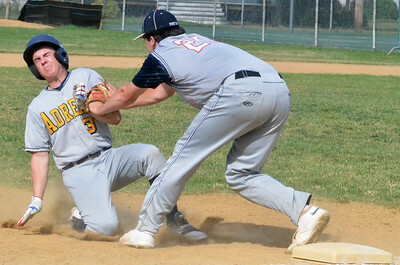 KYLE MENNIG - ONEIDA DAILY DISPATCH Sherrill Post's Andrew Roden (20) tags Adrean Post's Daniel Fitzgerald (3) during their American Legion Baseball District 5 playoff game in Sherrill on Sunday, July 17, 2016. 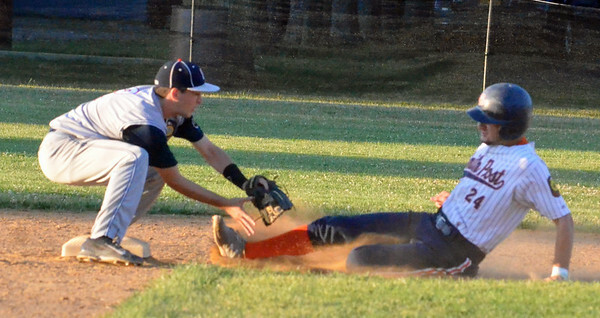 KYLE MENNIG - ONEIDA DAILY DISPATCH Smith Post's Gavin Chambers (28) slides safely into third on a wild pitch under the tag of Sherrill Post's Ryan Palmer (9) during their American Legion Baseball game in Sherrill on Friday, July 15, 2016. 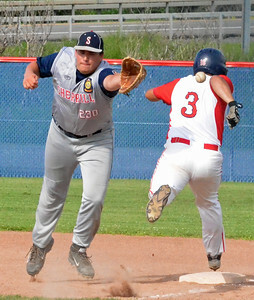 KYLE MENNIG - ONEIDA DAILY DISPATCH Adrean Post's Zack Brush (1) slides safely into home with the game's first run as Sherrill Post catcher Nate Palmer (22) jumps to try and catch the ball during their American Legion Baseball District 5 playoff game in Sherrill on Sunday, July 17, 2016. 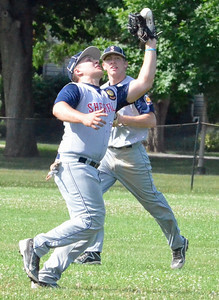 KYLE MENNIG - ONEIDA DAILY DISPATCH Sherrill Post's John Bickom (10) catches a fly ball in left field in front of teammate Mitch DeBarr to retire an Adrean Post batter during their American Legion Baseball District 5 playoff game in Sherrill on Sunday, July 17, 2016. KYLE MENNIG - ONEIDA DAILY DISPATCH Sherrill Post's Mitch DeBarr (11) dives into second for a stolen base as the ball gets away from Adrean Post's Michael Zaino (9) during their American Legion Baseball District 5 playoff game in Sherrill on Sunday, July 17, 2016. KYLE MENNIG - ONEIDA DAILY DISPATCH Adrean Post's Daniel Fitzgerald (3) slides safely into home under the tag of Sherrill Post's Jacob Purdy (31) during their American Legion Baseball District 5 playoff game in Sherrill on Sunday, July 17, 2016. 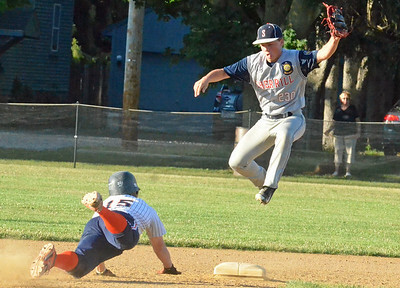 KYLE MENNIG - ONEIDA DAILY DISPATCH Utica Post's Nick Abraham (3) safely reaches first as the throw gets away from Sherrill Post's Ben Ziarko (25) during their American Legion Baseball District 5 playoff elimination game in New Hartford on Monday, July 18, 2016. 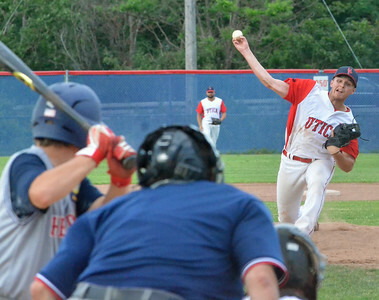 KYLE MENNIG - ONEIDA DAILY DISPATCH Sherrill Post pitcher Devin Long delivers a pitch to a Utica Post batter during their American Legion Baseball District 5 playoff elimination game in New Hartford on Monday, July 18, 2016. 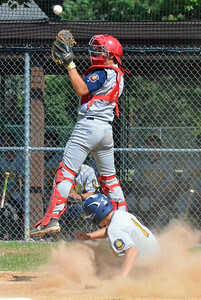 KYLE MENNIG - ONEIDA DAILY DISPATCH Sherrill Post's Mitch DeBarr (11) dives back into first under the tag of Utica Post's Chez Castronovo during their American Legion Baseball District 5 playoff elimination game in New Hartford on Monday, July 18, 2016. KYLE MENNIG - ONEIDA DAILY DISPATCH Utica Post's Brian Wojnas (15) catches the ball for the final out against Sherrill Post during their American Legion Baseball District 5 playoff elimination game in New Hartford on Monday, July 18, 2016. 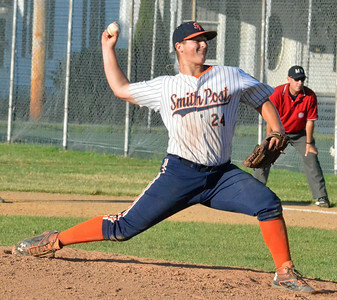 KYLE MENNIG - ONEIDA DAILY DISPATCH Utica Post pitcher Parker Goldsmith (19) delivers a pitch to a Sherrill Post batter during their American Legion Baseball District 5 playoff elimination game in New Hartford on Monday, July 18, 2016. 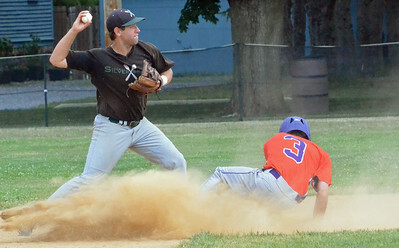 KYLE MENNIG - ONEIDA DAILY DISPATCH Sherrill Silversmiths second baseman Dylan Pounds avoids the slide of the Cortland Crush's Broderick Santilli and throws to first for a double play during their game in Sherrill on Wednesday, July 20, 2016. 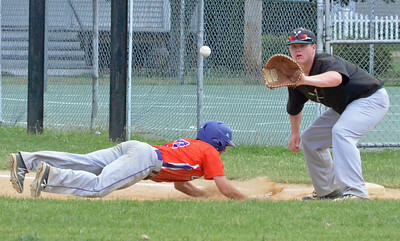 KYLE MENNIG - ONEIDA DAILY DISPATCH The Cortland Crush's Broderick Santilli (3) dives back into first as Sherrill Silversmiths first baseman Ryan McNamara (14) awaits a pickoff throw during their game in Sherrill on Wednesday, July 20, 2016. 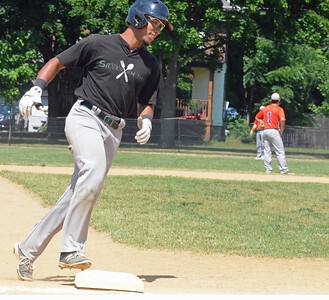 KYLE MENNIG - ONEIDA DAILY DISPATCH Sherrill Silversmith Skylar Mercado rounds third after hitting a game-winning grand slam against Cortland in the bottom of the eighth inning of their game in Sherrill on Wednesday, July 20, 2016. 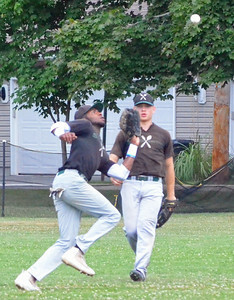 KYLE MENNIG - ONEIDA DAILY DISPATCH Sherrill Silversmith left fielder Michael Villa (7) makes a catch to retire a Cortland Crush batter as teammate Christian Aybar looks on during their game in Sherrill on Wednesday, July 20, 2016. 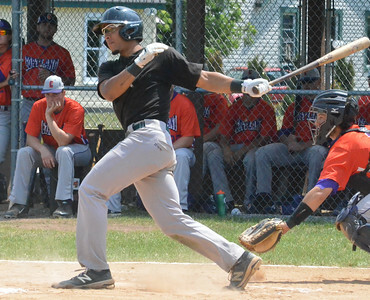 KYLE MENNIG - ONEIDA DAILY DISPATCH Sherrill Silversmith Skylar Mercado follows through on a swing against the Cortland Crush during their game in Sherrill on Wednesday, July 20, 2016. 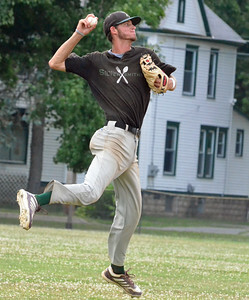 KYLE MENNIG - ONEIDA DAILY DISPATCH Sherrill Silversmiths shortstop Danny Crews jumps to make a throw to first to retire a Hornell Dodgers player during their NYCBL game in Sherrill on Wednesday, July 13, 2016. 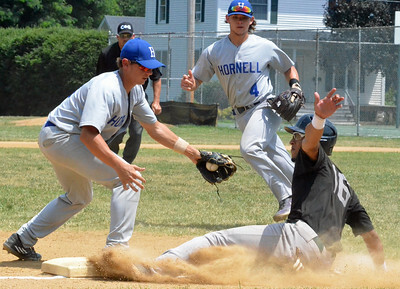 KYLE MENNIG - ONEIDA DAILY DISPATCH Sherrill Silversmith Skylar Mercado (16) slides safely back into third under the tag of Hornell Dodger Ty Reginelli (3) during their NYCBL game in Sherrill on Wednesday, July 13, 2016. 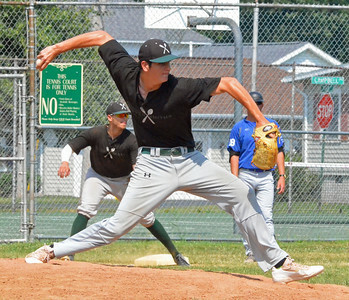 KYLE MENNIG - ONEIDA DAILY DISPATCH Sherrill Silversmiths pitcher Zack Durant delivers a pitch to a Hornell Dodgers batter during their NYCBL game in Sherrill on Wednesday, July 13, 2016. 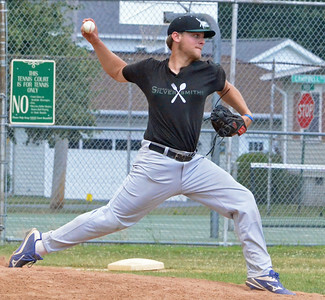 KYLE MENNIG - ONEIDA DAILY DISPATCH Sherrill Silversmiths pitcher Mitch Cavanagh delivers a pitch to a Hornell Dodgers batter during their NYCBL game in Sherrill on Wednesday, July 13, 2016. 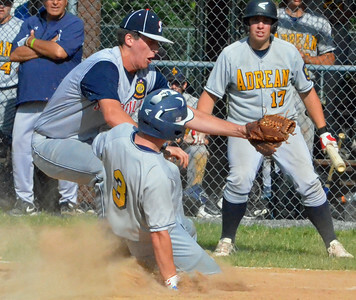 Sherrill Post's Andrew Roden (20) tags Adrean Post's Daniel Fitzgerald (3) during their American Legion Baseball District 5 playoff game in Sherrill on Sunday, July 17, 2016.